Editor’s Note: The following article is an excerpt from Take Control of Podcasting on the Mac, a $10 electronic book available for download from TidBits Electronic Publishing. The book looks at picking appropriate hardware, editing and encoding podcasts, and promoting your finished podcast; this excerpt focuses on podcasting recording. Recording a podcast is about capturing audio. You may record your voice, include a song, interview somebody over Skype or iChat, or play sound effects. No matter what the source of the sound, it has to be captured and recorded by software on your computer. 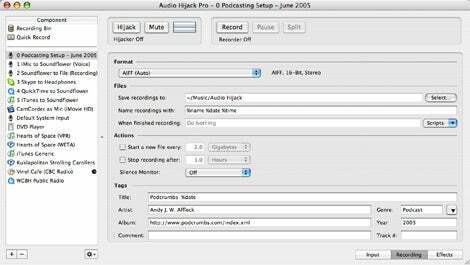 Audio Hijack Pro enables you to manipulate complicated streams of audio on your computer. At its simplest, it can take the standard audio input and record it to a file. But has much greater capabilities: the program can take in audio from multiple sources, mix those tracks together, post-process the sound with any number of interesting (or scary) audio effects, and then encode the audio directly to an MP3 format file. With Audio Hijack Pro, I can do lots of recording tasks—record interviews using Skype, play music, create voiceovers, and more. The application has never crashed on me, and switching applications while recording does not result in any dropouts or other weird problems. The first time you run Audio Hijack Pro, it suggests that you let it install three extras. 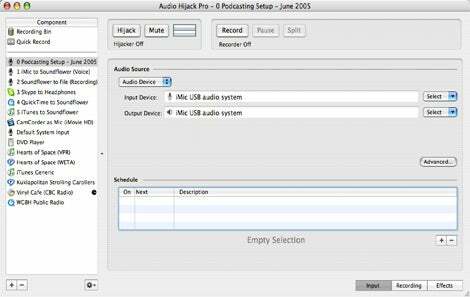 • Instant Hijack: This system utility allows Audio Hijack Pro to grab audio from any running program. 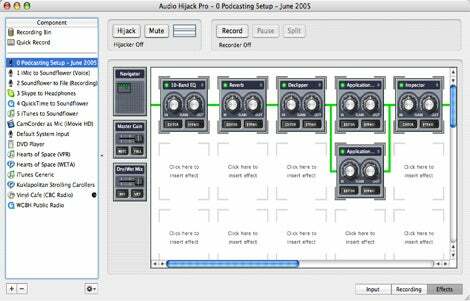 Without installing Instant Hijack, Audio Hijack Pro needs to quit and re-launch a running program to hijack its sound. This gets in the way of setting up all your sound sources in advance. • Soundflower: You may or may not need Soundflower depending on the complexity of your podcasts. There is no harm in installing this extra; it may well come in handy. • Schedule Helper: This utility makes scheduled recordings without Audio Hijack Pro already launched. Without it, you have to leave Audio Hijack Pro running all the time or set as a startup program (Launch System Preferences, open the Accounts preference pane, and use the Login Items tab). If you plan on scheduling recordings then you should install this extra. For instance, I use this feature to record CBC Radio’s The Vinyl Cafe every Sunday at noon. At the bottom left, click the Plus button to start a new session. Name the session whatever you want. I put a 0 (zero) at the beginning of the stream name in the screenshot below to keep it sorted at the top of my list. Click the Input tab (if you’re not already viewing the Input pane). Set your audio input to your current microphone by selecting it from the Input Device pop-up menu. The screenshot shows the settings for my iMic USB from Griffin. You may be using line-in or even the built-in mic. The input options for your podcast session in Audio Hijack Pro. Notice the buttons at the lower right, which you click to switch to panes where you set recording and effects preferences for the session selected at the left. Set your audio output to your headphones by selecting an option from the Output Device pop-up menu. This lets you hear what you are recording. In the case of the above screenshot, the headphones are connected to an iMic USB. Click the Recording tab. Choose the audio format you wish to use. If you are in doubt, stick with AIFF (auto) as shown in the screenshot below. The Recording options for your podcast session in Audio Hijack Pro. At the bottom of this pane, fill in values for your tags. Click the Effects tab. This is the most complicated pane, but also the most fun. Here is where I have already added all the effects that I use to make myself sound better. I then mix in other audio sources and monitor the levels on my entire podcast. These audio effects are applied in real time rather than after recording is completed. The screenshot below shows how I set these set up. My effects are set up and ready to go with a full set of recommended effects for a podcast recording session. 10-Band EQ: I use this to tweak my voice and drop out some of the room noise (mainly the hiss from the central air system of my house). I also adjust the EQ settings so spoken “S” sounds are far less hissy; otherwise, it’s annoying to listen to. Reverb: I add just a touch of reverb so my voice doesn’t sound quite so flat. You need only a little unless you want to sound like you record your podcast in a cathedral. Declipper: This effect makes sure that no overly loud sounds make it through to your recording. It quiets the loudest sounds, which is a good idea as overly loud sounds badly distort your voice. 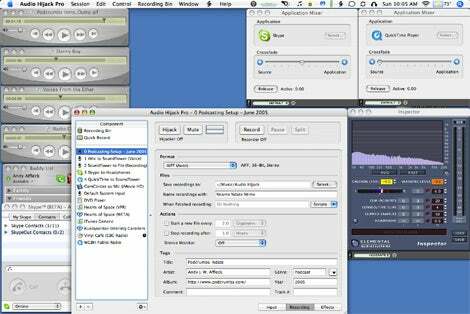 Application mixers: I mix sounds in from QuickTime Player and Skype. You can also mix in iChat AV and any other application from which you need to record sounds. Inspector: This doesn’t actually change your recorded sound but displays a window showing your current levels which helps you monitor output volume. When all the input/output preferences are set, you are ready to record. Here’s a window into how I make a podcast using Audio Hijack Pro. Prepare all audio I open all audio clips I want to play in QuickTime Player (Pro or regular), even music files. I don’t use iTunes because the window takes up much more room than a bunch of smaller QuickTime Player windows. I also don’t have to worry about iTunes starting on the next song if I forget to stop it at the end of the one I was playing. Find the song in iTunes. Choose File: Show Sound File (or press Command-R, or Control-click the track and choose Show Sound File). Drag the exposed file in the Finder onto the QuickTime Player’s icon in the Dock. Record the show Once everything is on my screen (pictured below) and ready to roll, I click Hijack at the top of the Audio Hijack Pro window, get my headphones on, and verify sound levels by performing a quick test: I click Record, talk for a few seconds, and click Record again to stop recording. I switch to the Recording Bin in the session list on the left side of the Audio Hijack Pro window, locate the most recent file, and click the Preview icon. If it all checks out, I throw that file away and return to my podcast session. On the left of the screenshot are the QuickTime windows, one for each clip or song I plan to play. Below them at the bottom left are Skype and iChat windows in case I have any conversations with other people planned. In the middle is the main Audio Hijack Pro window. On the upper right are the Application Mixer windows for QuickTime and Skype. On the bottom-right is my Inspector window so I can monitor my audio levels. I click Record to start Audio Hijack Pro recording. I say the podcast name and date. I click Play on my intro music in its QuickTime Player window. At a certain point in my intro music, I drop the volume using the slider on the Application Mixer window in Audio Hijack Pro for QuickTime and begin my standard intro. I talk, and, when I need to play other audio files, I click play in the various QuickTime Player windows, adjusting volumes as needed. I record my outtro, including the title of my show, my name and contact information, and the address of my website. I stop the recording by clicking Record again. From here, I move on to SoundStudio to trim. I usually need to clip just a touch off the front, because I tend to click record and then wait a second before I start talking. I save the final cut of my podcast and I’m ready to compress it and get it online! Tip: To make your podcast more useful, announce the podcast name and date at the very start of your show before any intro music is played. This helps people who are using MP3 players that do not have screens (such as the iPod shuffle), and people who are not in a position to see their screen. Once listeners know the show title and date, they can decide whether or not they want to listen to it or skip to the next track on their device.